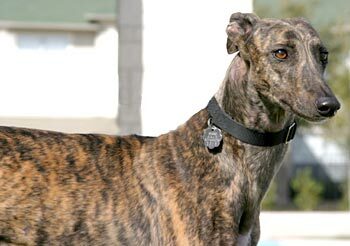 Betty Lou, aka BL No Remorse, is a striking, 3-year-old dark brindle female born December 6, 2005. Her sire is Get Over, and her dam is Glory Halo. 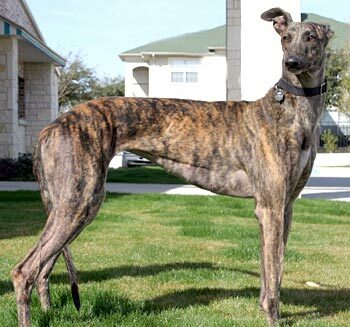 Betty Lou’s racing career consists of 69 races, starting July 23, 2007, at Southland Greyhound Park in West Memphis, AR, moving to Valley Race Park in Harlingen, TX, on the Dubuque, IA, and finishing her last race on February 18, 2009, back at VRP. Her career ended with a fractured toe on her right rear foot, which has now healed. Betty Lou is not cat tolerant. We will test her with small dogs at a later time. 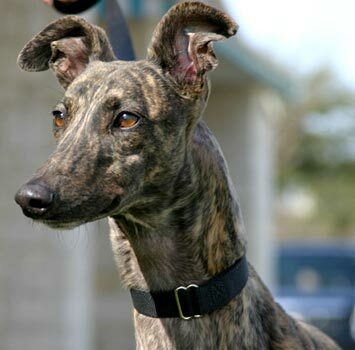 Betty Lou is an energetic girl staying at one of GALT's kennels. She loves attention and Kongs stuffed with canned dog food. 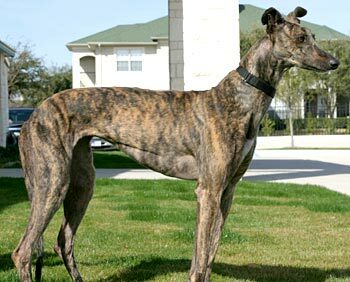 She enjoys brisk walks and if you are up for it, will even jog with you for short distances. Although Betty Lou has lots of energy, she will settle down for a hair brushing when she's in her kennel space. We think she'll be a great companion once she can release her pent-up energy more often.